The beautiful park offers camping and trails in an oak woodland forest, with a sprinkling of pines and lovely meadows with creeks. 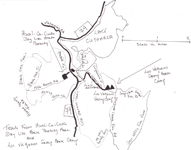 There are over 100 miles of trails which accommodate hikers, bikers, and equestrians. There are magnificent ocean and desert views. The trails are open to hikers, cyclist and equestrians. 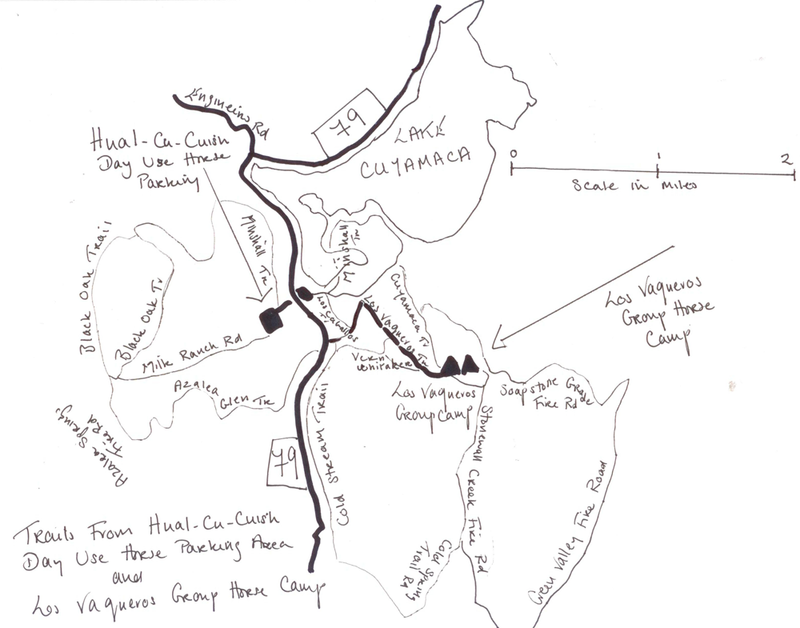 Some trails have restricted use, so check the map. Dogs are allowed in the campgrounds, leashed, but are not allowed on the trails. There can be snow in winter and I have ridden in the Cuyamacas in strong wind and also in hail. The single track trails can get very soft in wet weather. The trails can become impassable due to fallen trees and branches. Also, there are places where the trail is narrow, steep and rocky. Don’t let this stop you. In good weather, it is superb. For the most current information on the park, check their website . The park phone number is 760-765-0755. Also, check the Mountain Weather Forecast. 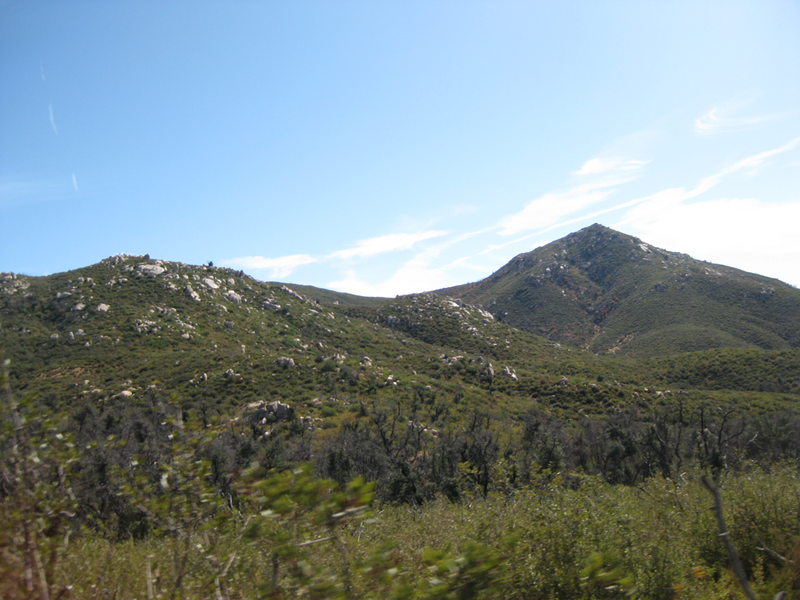 The best way to experience Cuyamaca State Park is to explore it. You need to stay on the trails. The trails are well marked. I strongly recommend that you buy a trail map at one of the local stores. I am going to describe the main parking areas, and some trails you can try. There are many more trails. If you have time, email me with your favorite trail and I will update this page. This campsite, located about 2 miles north of the southern boundary of the park on Highway 79, opened up in November 2010 and is reserved for equestrians and their horses and mules. It is open for reservations through November. Check out their website for more informations or call 800-444-7275. 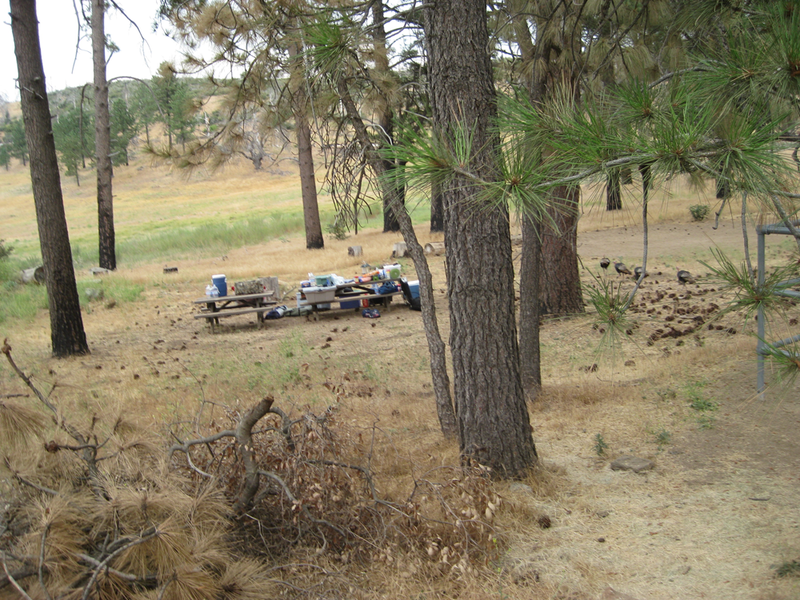 This parking area is located north of the Green Valley Campground inside Cuyamaca Rancho State Park. There are no facilities at this location and they ask that you not leave any horse manure in the parking area. This is a huge parking area with lots of room for you and your truck and trailer. The parking lot is open from sunrise to sunset. You can ride trails either side of Highway 79 by crossing the stream under the bridge. The east side trails after an initial climb, arrive at a mesa, whereas the west side trails tend to be steeper. On the west side of Highway 79, turn right (north) on the West Side Trail. Then turn left (north west) on Japacha Fire Road. Turn left (west) on West Mesa Fire Road. You can complete the loop by turning left (south) along Monument Trail or turning right (north west) along Arroyo Seco Trail and then left (south) on Arroyo Seco Fire Road. You return from either trail by turning left (north) on the West Side Trail. (5-7 miles, moderate, with a few challenging (steep and rocky) places). From the parking area, take the main trail which is the Merigan Fire Road. After a couple of miles or so, turn right (east) to stay on Merigan Fire Road. Turn left (north) just before Highway 79 on to the Blue Ribbon Trail After another couple of miles, turn left (west) on South Boundary Fire Road. 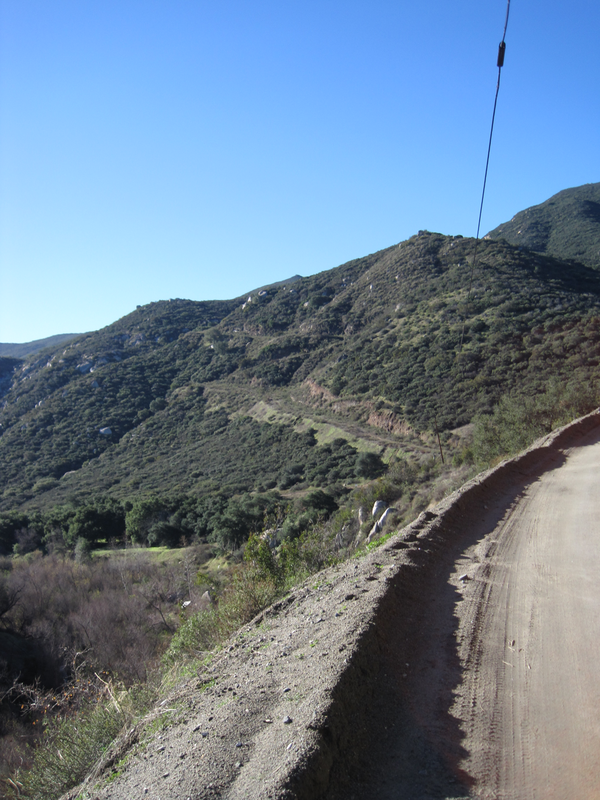 You can return by turning down Sweetwater Trail which leads back to Merigan Fire Road. Or you can continue along South Boundary Fire Road which turns into Dead Horse Trail. 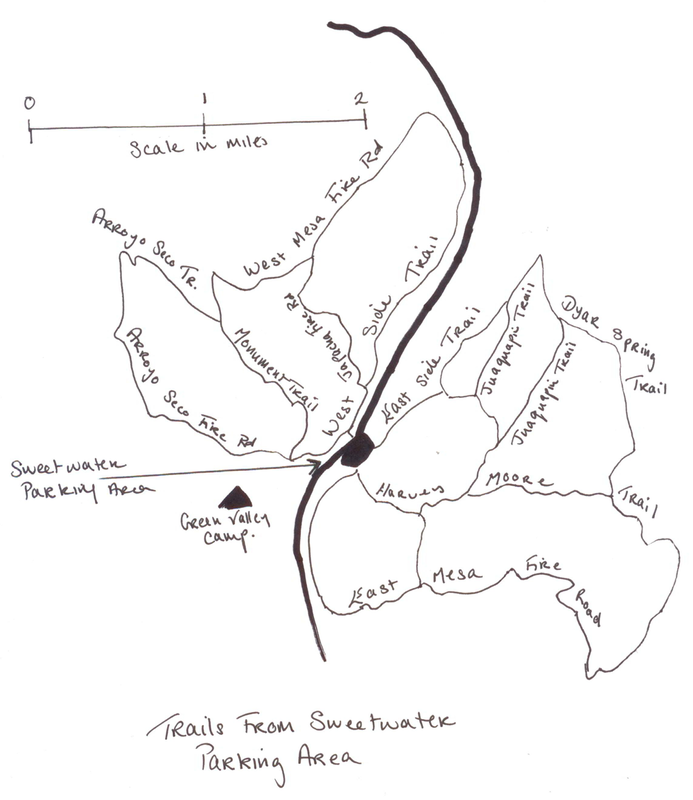 You can turn left (south) down the Sweetwater Trail or continue down Dead Horse Trail. Both trails lead back to Merigan Fire Road. This is an easy 7-9 mile ride, although there are some steep and rocky spots on Dead Horse Trail. 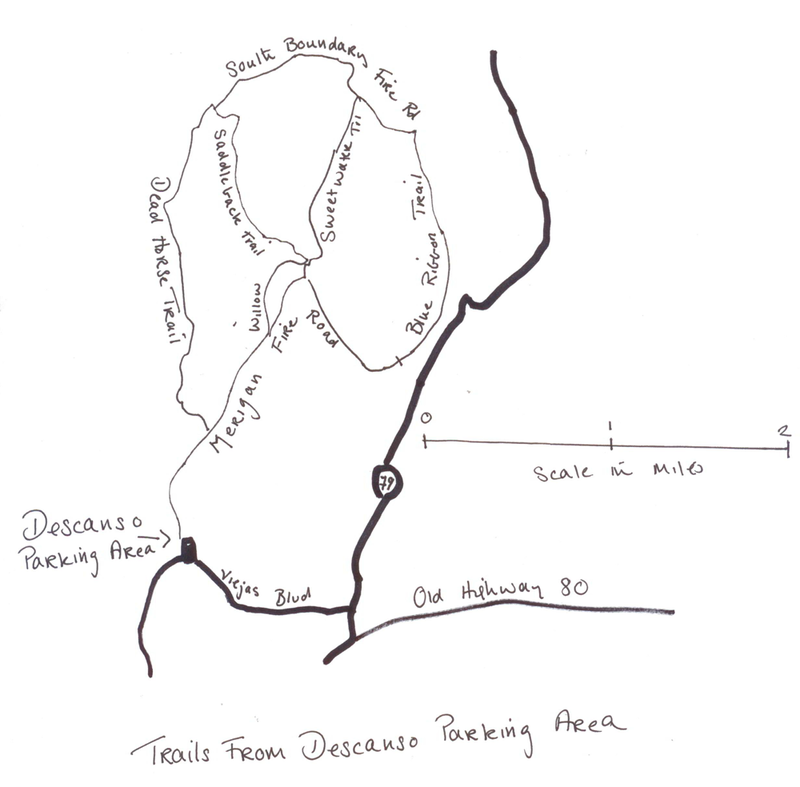 Description of Arroyo Seco Fire Road and South Boundary Fire Road which is an extension of the trail from this trailhead. This group horse campground is available by reservation from mid May until mid September. You may make reservations by contacting Reserve America. The group horse camp is located on Los Caballos road, about 2 miles east of Highway 79, inside Cuyamaca Rancho State Park. There are tables, BBQs, water faucets and a large fire ring. The camp has its own restroom with showers. Pipe corrals are available for horses. The site is limited to 80 people, 45 horses and 50 vehicles, which include trucks and trailers. There is a 50 foot limit on all vehicles. 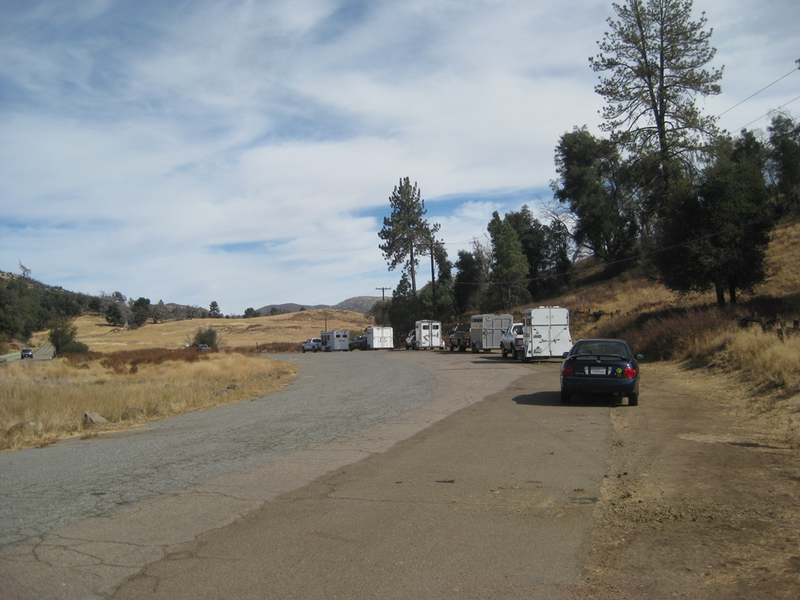 This parking area is located inside Cuyamaca Rancho State Park at the southern edge of Cuyamaca Lake along Hwy 79. 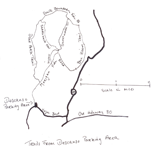 The facility is available for you to park your truck and trailer for the day off of the highway and access the horse trails in this area of the park. As this is a temporary parking area, there are no facilities and they ask that you not leave behind any horse manure. The parking lot is open from sunrise to sunset. Starting from the east side of Highway 79, take Minshall Trail along Cuyamaca Lake, There are lovely views of Cuyamaca Lake, but it can be wet underfoot. Take a right turn (south) on Cuyamaca Trail past Los Vaqueros Group Camp. Return to Highway 79 via Vern Whitaker Trail, and if you like, do another loop on the west side of Highway 79, taking Milk Ranch Road to Black Oak Trail and back to your trailer along Middle Peak Fire Road.